Wed. June 10th, 2009 – 5:00pm-8:00pm. Cost $45 ($35 for Friends of OHEKA members). Gold Coast – OHEKA Castle. Melius Family “success story” – OHEKA Castle Hotel & Estate. Garden Party. We sincerely thank you for your support. 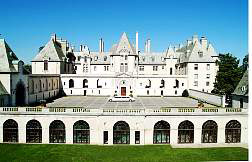 www.OHEKA.com to learn more about the Castle.